We've all seen the Real Estate TV shows with potential buyers walking through picture-perfect homes for sale, critiquing every corner. This isn't just scripted TV episodes -- nowadays with HGTV and Pinterest lingering in the back of their minds, buyers really do expect a home to meet their standards in every sense of the word. 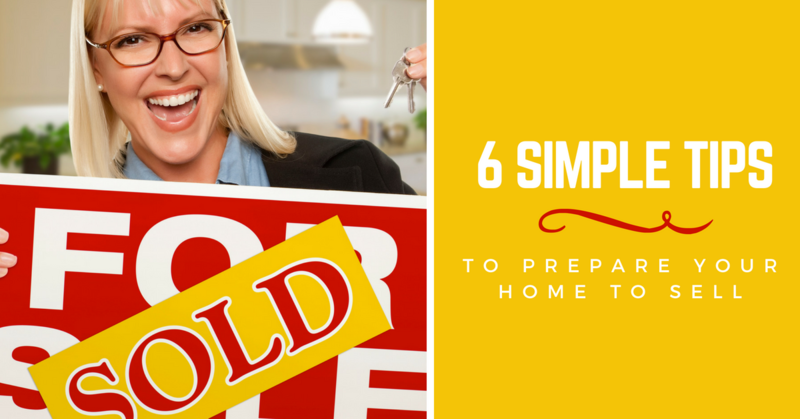 Preparing for your house to be sold can seem like an insurmountable task, but if you tackle each goal one by one, you'll have a show-ready home in no time flat! The first step to preparing your home to put on the Real Estate market is cleaning up and decluttering. Now is the time to purge if you plan on doing so. Making boxes for donations is a great way to clear your house of unwanted items. If you don't plan to purge, consider getting an off-site storage unit to store unneeded items while you're showing your house. If you have kids, this part can be tough since kids, especially babies and toddlers, have a lot of big toys and equipment. Make smart decisions on what to store, donate, and keep out. It may be best to do this while your children are away from the home with a sitter or at school. Be sure to keep their absolute favorites, though. Buyers are usually understanding when they realize that kids live in the home. Don't forget to clean all countertops off in the kitchen and the bathrooms. If you have various items that you use frequently, like toothbrushes and toothpaste, make a basket to go underneath the sink that you can store neatly when your home is showing. The less clutter in your home during showings, the better. Having nice furniture and decor goes a long way. You may think that buyers can look beyond possessions in the home, but the truth is, buyers get a first impression as soon as they walk through the door. Inviting, updated decor gives a feeling of cleanliness and upkeep. If you don't have nice decor and you're on a budget, consider going to a discount store and buying inexpensive throw pillows, faux greenery, simple table centerpieces, and other small items to make your home seem more inviting. If you already have beautiful decor, just use what you've got! Another option is home staging. These companies come in and stage your home with their furniture and decor for a price. Typically, these staging companies hire designers or decorators to make your home look as appealing as possible. Home staging is worth looking into if your furniture and decor are outdated, or if you plan on moving out before you list. Selling a house requires a lot of cleaning. The biggest mistake a seller can make is to show a dirty home. You'll want to deep clean your house from top to bottom before you're ready to sell. That means cleaning baseboards, the inside of the pantry, window sills, fan blades, the insides of drawers, scrubbing grimy bathtubs, and more. Try to choose cleaners that smell fresh, but not overbearing. As sad as this sounds, Fido may need to find temporary housing with a friend or relative while you're preparing your home to be sold. Dogs, cats, and birds are wonderful -- but not when you're selling a house. Pet odors and fur are hard to get rid of without removing the pet temporarily. If this isn't an option, be sure to bathe your pet and keep his area as clean as possible, and consider blocking an area off just for your pet. Buyers who notice small issues and may begin to wonder if there are larger issues lurking, even if that is not true. If you know something is broken, fix it preemptively before a buyer tries to negotiate off of the sales price due to something minor. Touch up any chipped paint in or outside of the home, fix cracked windows, fix any broken appliances, and address anything else that may become a problem after you list your home. Smells can make or break a deal. Some homes smell like pets, smoke, or may even just have a distinctive lived-in odor. You'll want to eliminate all smells in the home by cleaning and removing old items from the home -- you'd be surprised at the odors old things can hold onto. To continue keep the clean smell, clean regularly, and consider wax melts or air fresheners throughout the home. If you're into more natural options, diffusing essential oils are a great way to make your home smell lovely without harsh chemicals. After working so hard on the interior of your home, you may be ready to go ahead and list, but don't forget that the exterior is the first thing home buyers see when they walk up to your home! Pressure washing, decorating the front with a new welcome mat, and adding some colorful flowers to pots outside of your door are great ways to welcome potential buyers. If you have already-existing flower bed, spruce them up with new mulch and colorful annuals. Don't forget to clean your porches and windows! By working through these steps one-by-one, your home will be ready to show in just a few short days. Happy selling!